This article starts off a series discussing how in the past few weeks we’ve run a new marketing campaign based on a missed opportunity, and how you can do the same. About a month ago our marketing team noticed an opportunity we hadn’t seen before: other software companies like ours were using their integration with Mailchimp to drive serious sales. Sure, we included our integration as one of the benefits of using Wishpond’s marketing software. And the fact that we had it did convert site visitors who were already on our site - but it wasn’t driving visitors to our site as it was for competitors. For other businesses, the integration was a sales point. For us, it was the cherry on top. We were missing an opportunity, and every moment we ignored it dollars were falling through our hands like snow in January. This article will break down what that four-step process looked like, hopefully informing your own marketing campaign along the way. Before you can get rolling with analytics, strategizing or budgeting you’ll need to establish a concrete, immovable campaign hypothesis. It’s the thing you’re trying to prove correct (and trying to get resources for). It can be a simple concept, like “Doing X will Result in Y” or, more appealingly, “Doing X will Earn us Y”. Imagine your campaign hypothesis like you do the subject line of an email or title of a blog article. Not only is proving this hypothesis the objective of your campaign, it’s also the thing that keeps you and your team on track. People are looking for lead-generation software that can integrate directly with their Mailchimp account, and investing in paid promotion and marketing will help us to acquire these people as customers at a positive ROI. It’s direct and specific: We specify that we’re focusing on Mailchimp only, instead of all of our integrations as a whole. We also specify that we’re focusing only on new customers, rather than existing leads or clients (at least for now). It’s clear but ambiguous: The goal of “a positive ROI” is one of our favorites, particularly when our campaign involves as much testing as this one does. In other words, we needed to prove that A) There was a gap in our marketing strategy and B) Filling that gap will benefit us. Like many other businesses, when we need to prove a hypothesis, identify a problem, or simply learn more about the way our business works, we go to our analytics platform. Below is a screenshot of the organic search traffic to our Mailchimp integration landing page between the first of September and the 15th of November. 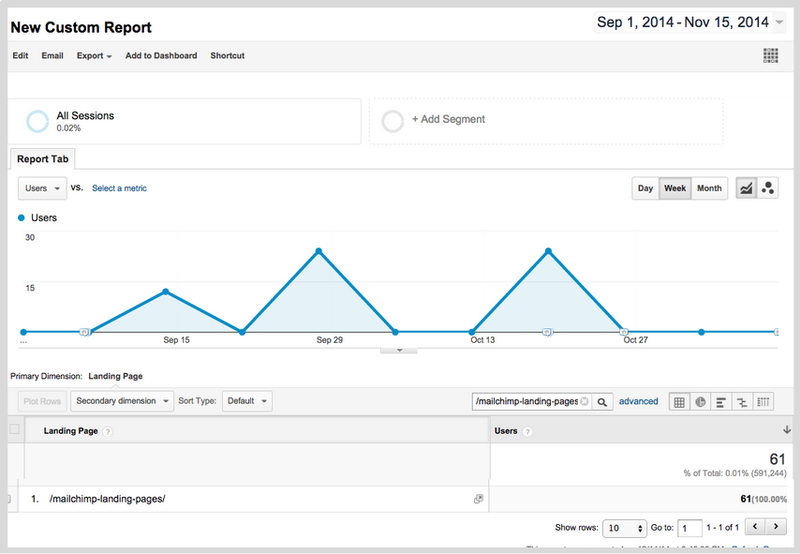 This table shows the page seeing 61 organic visitors on a part of our website that receives about a half million a month. We’re seeing incredibly scant traffic on a part of our website that should be helping to sell our products. Not only does this graph show that we aren’t promoting our Mailchimp integration with advertising or content, it means that nobody is finding us when they type in our target keywords: “mailchimp integration + landing pages” into Google. We need to prove that this campaign (and the budget we’ll be allotting to it) is worth doing. The best way to do this - at least for our business - is to prove that our customers want it. We do this for two reasons: First and foremost because we genuinely want to help our customers. Ensuring that the maximum amount of people know that we have a very helpful integration with a very popular email service is a good thing for our customers. Secondly, we do it because a happy customer is a loyal customer, and we like loyal customers. This table shows (for those who aren’t already massively familiar with this platform) that (between the 6-week period shown above) 68 of our existing customers clicked “integrate with Mailchimp” from within our dashboard and were sent to the “Thanks for Integrating” page. In other words, 68 of our existing clients wanted to integrate with Mailchimp and did so within our platform. If our existing clients want something, we can bet that our prospective clients will. 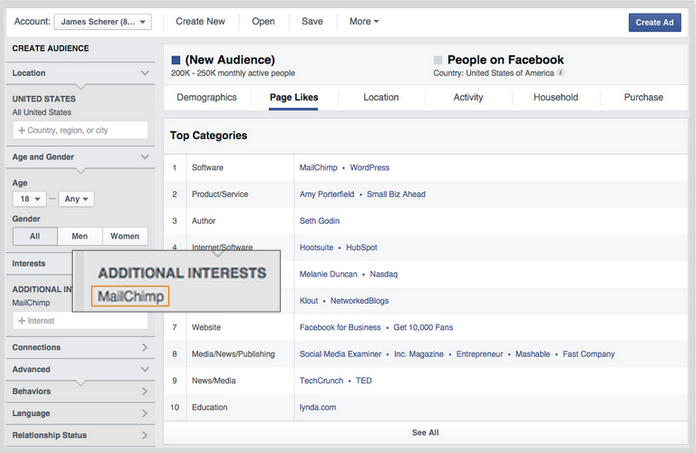 This past June, Facebook introduced users to a very cool little tool called Audience Insights (screenshot below). The tool allows you to see the Demographic details, Page Likes, Location and Activity statistics of a chosen targeted audience. We plugged in Mailchimp’s Facebook Page to determine the makeup of its Fans (and subsequently prove that the people who use Mailchimp are within Wishpond’s target market). This list of Likes fits our target market perfectly. We’re also seeing the right audience size for a promotional campaign (about 225,000 users) as well as companies, authors, websites, apps and products we’ve seen our customers like previously. Once we’d decided on our hypothesis, determined that a missed opportunity existed and were convinced that taking advantage of that opportunity was worth it, we needed to outline exactly what our strategy was. We discussed the best ways in which we could run this campaign, and what we needed to achieve it. We decided on an initial budget of $500 with which to test (almost all of which would go towards ads). Throughout this strategy our team needs to keep an eye on the resources and time we’re expending. After all, our hypothesis is based on a positive ROI. This means keeping in mind ad budget, the cost of A/B testing and tracking software, but also the number of people who are involved, what their time is worth, and how much of that time was spent. It doesn’t matter if you’re marketing a brick-and-mortar shoe store or a mutlinational conglomerate, this article’s strategies to set up a marketing campaign are applicable for every marketing campaign imaginable. There’s flexibility, sure. Some businesses will be structured less than others, or need even more oversight and paperwork. But the basics: hypothesis, proof, value and strategy, all remain the same. The next articles in this series will be more specific - diving into the exact strategies we implement to prove our hypothesis. I’ll show you specifically how we utilized Facebook Advertising, get into landing page optimization and A/B testing, dive into analytics and heat-mapping before wrapping up with the success (or failure) of our campaign to promote our Mailchimp integration.